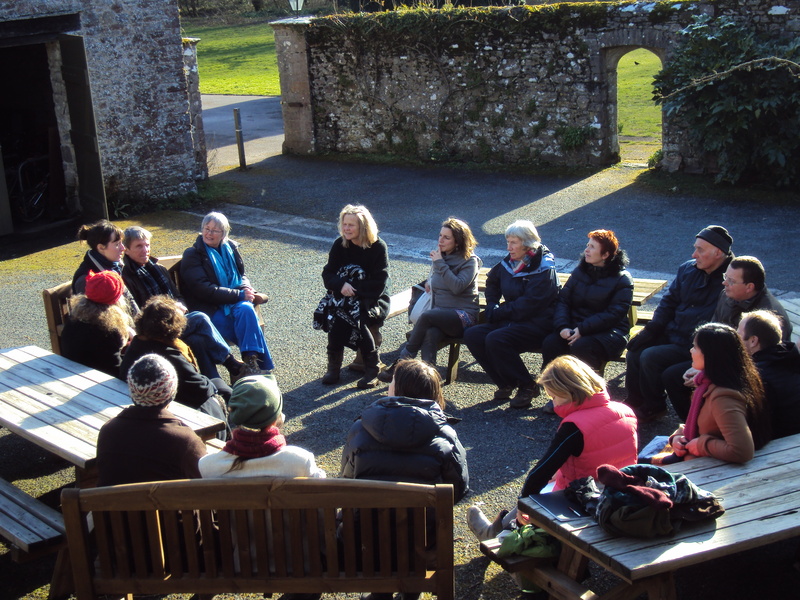 Between February and April this year, I led a series of workshops at Schumacher College in Devon which I called ‘Seeing with New Eyes – An Adventure in Perception’. 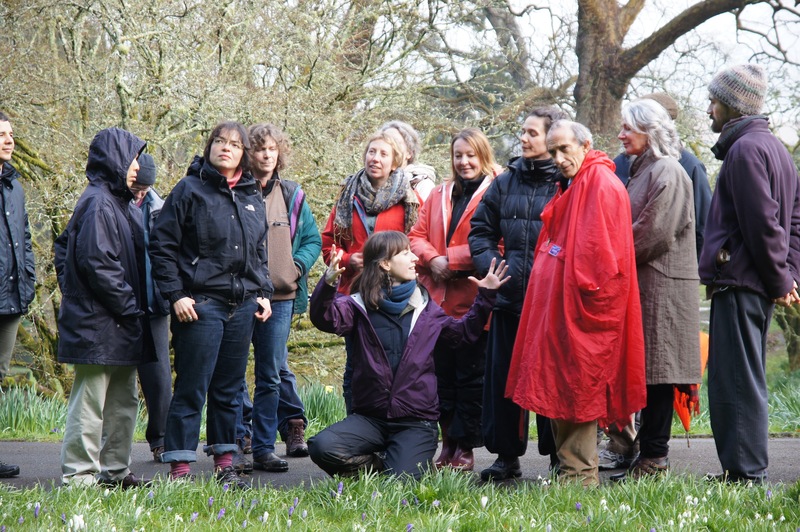 The workshops were designed to allow students to experience the practice of a phenomenology of Nature – which can also be called Goethean Science – without an overload of theory, just learning through participation. 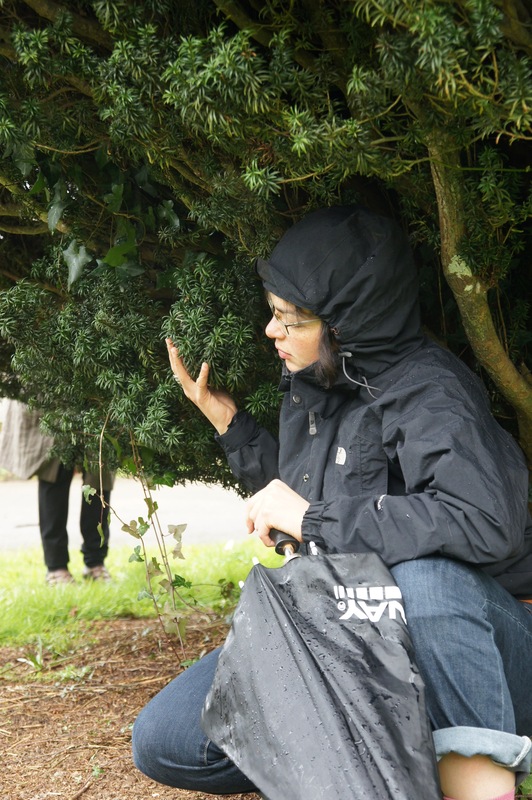 These workshops took the form of an experiential nature study and walk – observing yew trees on the Dartington estate – guiding people gently and playfully towards a more sensuous and intuitive way of perceiving and experiencing life. I worked with a variety of different groups of people including; a group of MSc Economics in Transition students, MSc Holistic Science students, short-course participants, Transition Town Totnes and the ‘Holistic Science Now’ short course group. The aim for me in these workshops was to facilitate an experience of getting to know the world in terms of itself, without getting caught up in explanations and abstract ‘knowledge’ of Phenomenology, instead just allowing the participants to practice it and to gain an embodied understanding from the outset. 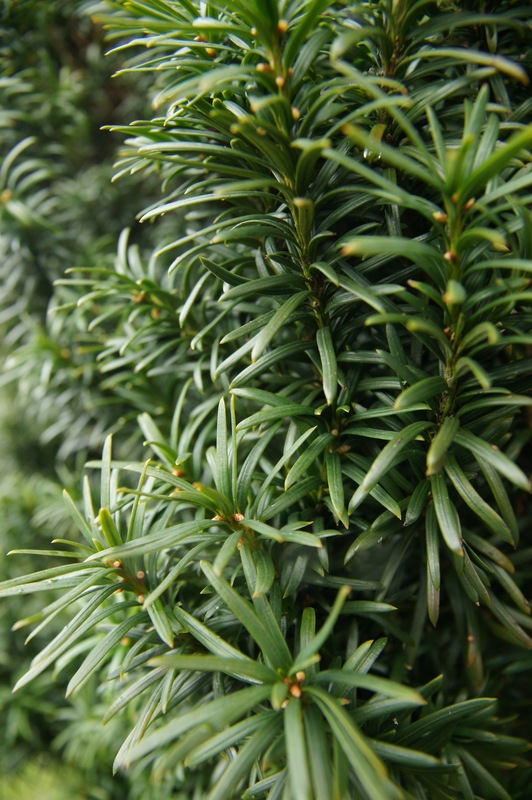 I chose the Yew tree as our phenomenon of study because I knew of three very different size and shape trees within walking distance of the college. A very straightforward aim for the workshop was helping the participants to see how unique and particular each manifestation in Nature is, and using comparison in phenomenology works excellently for that, as they get to see the ‘same’ phenomenon becoming itself in very different ways, in different instances. The workshop is an adventure and an experiment in perception and also in humanity. The participants are first invited to consider the question ‘how do we meet the world?’ and ‘how do we get to ‘know’ the world?’, while I describe a little of the thoughts and processes that brought these workshops into being. The nature of our analytical/Intellectual mind (left hemisphere) expresses itself through separating things into parts, fixes into certainties, and reduces to commonalities. It puts separate parts together and tries to make them belong. This can be very useful but the danger is that it can lead to static, ‘dead’ knowledge, mechanism and reductionism. We end up with information and use it to know things about other things. The nature of our sensuous/intuitive mind (right hemisphere) sees relations, wholeness and relationships. It is present to the natural unity emerging organically and dynamically from multiplicity. It presences the world, before the left hemisphere has had the chance to re-present it, and expresses itself by embracing diversity, dynamic and living knowing. It gets to know the world through direct experience primary to the abstractions of the analytical mind and enables us to think with things, not just to think about them. Iain Mc Gilchrist, author of “The Master and his Emmisary”, urges us not to slip into cognitive reductionism, as every function is mediated through both ways of seeing (hemispheres), but there is neverless a strong cognitive distinction that affects how we perceive the world. The left hemisphere re-presents the world, the right presences it. The approach of this particular workshop is phenomenological and hermeneutic, and so focuses on process and relationship, which in turn allows for intuitive perception through direct sense experience – and apart from a brief introduction to set the scene, it is always centred on practice, not on theory. In this way of working, as noted by Henri Bortoft in “Taking Appearance Seriously”, by returning to the senses through active seeing and exact sensorial imagination, we bring about a shift from the left-hemisphere dominance of the verbal-intellectual mind, to the right hemisphere experience of the wholeness of what is livingly present, which is characteristic of the sensuous-intuitive mind. “According to Empiricists see-ing the world is purely a sensory experience.” (Henri Bortoft). However, the answer is contrary to that – it is the way of seeing which ‘sees’ a leaf, tree, giraffe. The way of seeing and what is seen cannot be separated. There is more to seeing than meets the eye. Cognitive perception gets confused with just being sense perception. “We live in a dimension of mind which is, for the most part, as invisible to us as the air we breath” (Bortoft). Ordinarily our way of seeing is invisible, Husserl called it “everyday naïveté” – but we can make visible the activity of the mind to itself. Disenchantment with the world emerges when we miss the active, dynamic, receptive dimension of cognitive perception and ‘see’ ideas onto everything as fixed, static, finished products, rather than letting something be seen in terms of itself. When we engage with the world in a dynamic way of seeing, getting to know the world in terms of itself, be can begin to understand the uniqueness, creativity and dynamism inherent to life. Getting to know the world in terms of itself, involves engaging in conversation that brings forth our fullest human capacity to be in relationship with another living being, both human and non-human. Engaging from your heart space, not just your head space, and your right hemisphere, not just your left hemisphere. During the workshop we work to let go of habitual ideas, assumptions and generalizations. Organizing ideas such as ‘tree’, ‘chair’, ‘leaf’, are useful in everyday life, but they can be limiting in a deeper search for living knowledge. To begin to more fully understand Nature, and life, we must develop the capacity to encounter what is active and living. The practice of phenomenology asks us to become increasingly aware of how we meet the world and cultivate our relationships with it; to become more whole, authentic and human in our communication and conversation with the world. Conversing with the natural world is more challenging as it does not share our language of spoken word, so we need to develop other capacities for knowing/engaging with it in different ways such as intuition, direct sense perception and imagination. Although, these skills and processes are just as useful and valuable when applied in human encounters. A phenomenological ‘conversation’ is a mutual interaction and participation – a two way process. Through it we discover the ‘limitless’ nature of connections and relationships and also our potential to grow and adapt ourselves to new, alive ways of knowing, more adequate for the study of Life. During the workshops, and any further practice, you are treading a path of conscious development. Entering into a conversation, a riddle. Ponder, observe, ask questions. Being careful that it does not dissolve into chit-chat, nor become too narrow or rigid in focus. The encounters embody openendedness, openness, and an active receptivity. Expect to discover newness. Listen to what is revealing itself to you, with fresh new ears and eyes. It is a two way conversation, don’t be afraid to respond and interject with new questions. Goethe called this process a ‘Delicate empiricism’. 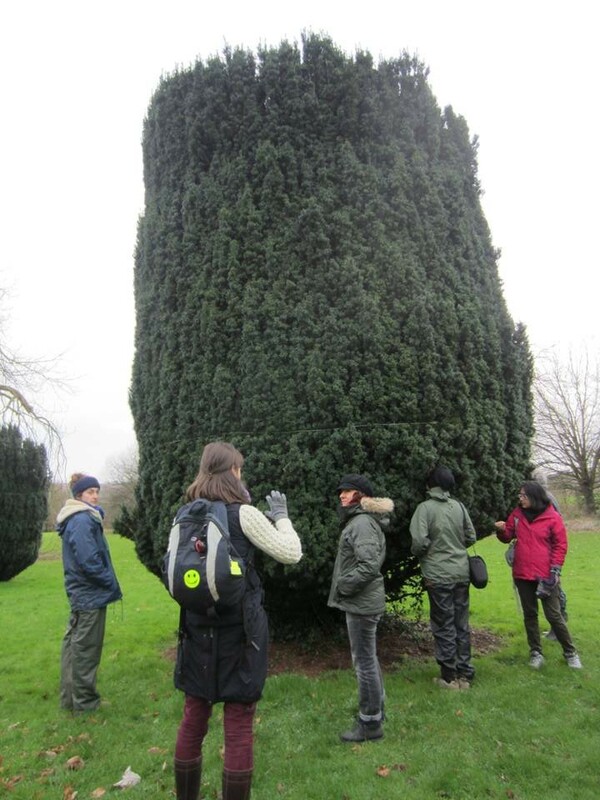 I took the participants to work with three Yew trees that we observed, described, imagined and intuited. Each was a different size, shape, age and in a different location. Even when walking I encourage you to see everything as if it is new to you, even the feeling of walking on the ground. Maintain the space within you for adventure and experiment. Cultivate a child-like wonder, see everything with fresh new eyes, as if for the first time. Be curious, open and gently expectant. Be aware and focused on all that you perceive. Be open – mind and heart. With a deep with of ‘getting to know’, like befriending. Observe up close, in detail. Form, touch, qualities, pattern, particularities, colour texture – but no association or judgment. Imagine, replay your exact sense perception like playing a video of it in your mind. Imagine growth and decay, coming into and going out of being. Backwards and forwards. Look for gestures, intuit patterns. Sketch the gesture as you intuit it. Repeat atleast three times with different trees, and after the second tree, compare and contrast the different trees. This workshop is taste of how we can learn how to encounter what is active and living in the world, rather than just relying on the simplified generalities of our everyday naïveté; or the abstractions of our intellectual mind to show us only separation, and what is ‘finished’. I graduated with an MSc in Holistic Science from SchumacherCollege in 2009 and have since continued refining my skills and cultivating integrated modes of knowing. I am passionate about sharing my insights into new ways of seeing and relating to the world from an organic, relational and dynamic perspective. 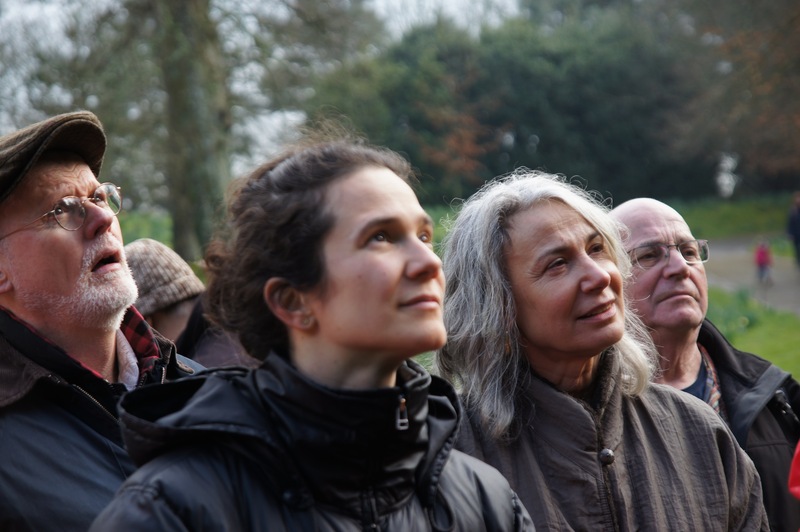 I believe that the shift in perception that these workshops aim for fosters a sense of wonder and an inner transformation which supports the transition that our world is desperately in need of. This entry was posted in Uncategorized and tagged A Pathway to Living Knowledge, eco therapy, Emma Kidd, Goethean Science, Henri Bortoft, hermeneutics, Holistic Education, Holistic Science, Ian McGilchrist, Phenomenological inquiry, phenomenology, Phenomenology of Nature, Practicing phenomenology, re-cognition, Schumacher College, sustainability, Transition Town Totnes on May 13, 2013 by roseyenglishangel.